In the previous post, we introduced vectors, and showed some very elementary uses for them. We presented them as a simple and convenient way to pack a number (3, in our case) of scalar values into a single object. Now, we’ll consider their geometrical representation, which will help you grasp them more intuitively. For simplification’s sake, we’ll use two-dimensional vectors for all our examples, but the same extends to 3D vectors. This might all sound confusing, but don’t worry, it’ll eventually “click” into place! If you don’t fully understand the concept now, don’t worry about it. 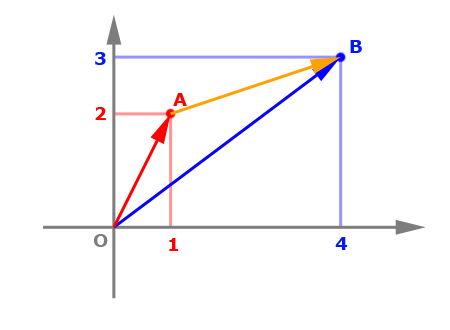 If you look to the axes, you’ll see that vector C (the orange vector) spans x from 1 to 4, meaning that its x component is 3 (4-1), and y from 2 to 3, meaning that its y component is 1 (3-2). The geometrical representation of vectors leads to a very intuitive way to understand one of their most important operations, length. The length of a vector (or magnitude) is simply its geometrical length! Take vector B, for example. It has a x component of 4, and a y component of 3. How can we get its length? The pythagorean theorem solves that for us: we simply take the square root of the sum of its squared components. For a 2D vector, length = sqrt(x²+y²). For a 3D vector, length = sqrt(x²+y²+z²), and so forth. For example, the length of vector B is sqrt(3²+4²) = sqrt(25) = 5. The reason why the order of the subtraction doesn’t matter is that (A-B) results in the opposite vector of (B-A), that is, a vector with the same length, but opposite direction. A-B results in (-3,-1), and B-A in (3,1). Both have a length of sqrt(10). If you don’t already use vectors (and I mean vectors in the MATHEMATICAL sense, not in the “dynamic array” sense that languages like C++ or Java use), this is probably going to be the single most useful piece of math you can learn for writing games. It’s easy, efficient, and makes your code much shorter. In fact, provided that you’re using a language that supports definition of operators for user-defined types (like, say, C++ or Haskell), using vectors is going to be extremely intuitive and simple. Much shorter, isn’t it? You now have half as many lines to write, test and debug. Not only that, but they’re also simpler, and you avoid a whole class of “copy-paste but oops forgot to change a letter in one place” bugs. So, after all, what ARE these vectors? How do they work? P.S. : If you’re using a language which does not allow you to define your own operators, the code above will get quite uglier… Java, I’m looking at you. Basically, all it does (so far) is take basic arithmetic operators and apply them to 3 values, instead of just one. When you add two vectors, it adds each component – x to x, y to y and z to z. There’s also the “scale” operator, which is the multiplication by a scalar (a scalar is a non-vectorial number, like a float). When you multiply a vector by a scalar, you simply multiply all components by it. So, if you want to make your vector twice as big, just multiply it by 2. That’s it! That’s the basic idea! Whenever you have two or more points and always want to perform the same set of operations on them, use a vector! In fact, most properties that apply to scalar numbers will also work here… If you happen to know that you need to multiply velocity by time to get a change in position, you can do that with vectors in just the same way you would with scalars. When should you use vectors like this? Whenever it makes sense. If you’re passing along two or three values which all represent the same point, do yourself a favor and pack them in a vector. Not only will it be much harder to accidentally mix up stuff, your code will be shorter. 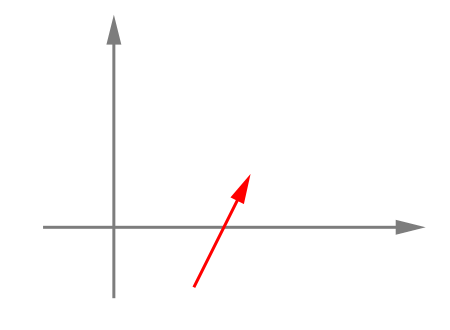 Even if they aren’t a POSITION, they might still be represented by a vector – for example, the size of a rectangle is a vector where x is the width and y is the height. 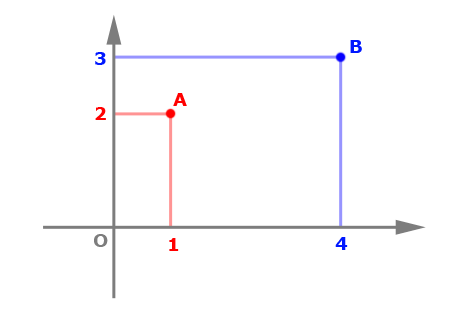 That way, if you have a vector representing the starting position of the rectangle, and a vector representing its size, you can easily find its ending position by adding them up. But vectors are far more powerful than this. On the next article, we’ll explore other common operations done on them, such as length, normalization, dot product and cross product. You wouldn’t believe me if I told you just how damn useful those can be. Here comes a harsh fact of life: game programming requires mathematics. One could say that programming IS, in a way, math, but you don’t really need to know math to write the vast majority of programs. Most of the time, you don’t need it to write parsers, to interact with databases, to validate data. Games, however, very often rely on mathematics. If you want objects to move across your world realistically, or if you want to draw things on the screen following certain geometric patterns, or if you want to check for collision between certain shapes, you need math. But don’t despair! Even though I say “math”, what you ACTUALLY need is geometry. Luckily for us, geometry is probably the easiest part of mathematics! Now, I’m not saying that discrete mathematics, algebra and calculus are useless for writing games (or other sorts of programs), but geometry is the bread and butter of video game programmers. An interesting thing that I did notice is that, despite my previous assertion, many game programmers do not actually know much geometry! This means that they’ll often do things in extremely laborious, buggy and verbose ways, when it could very easily be done with some basic grasp of geometry. For example, if you want to place several objects along an arc of circle, you COULD do it through trial and error, or place it in an image editing program (like Photoshop) and copying the coordinates, but it will be much easier if you simply use a parametric equation. While there are many basic and in-depth tutorials of all of the above topics on the Internet, explanations as to why the matter to game programmers and how to use them seem to be scarce, or left as an exercise to the reader. My goal is to make those topics easy to understand and put into use. Hello, my name is Rodrigo Monteiro, and this is my shining, brand-new blog. I have been a hobbist game designer and programmer for over a decade now, and have recently moved into the realm of professional game development. I am also creator of the “Aegisub” subtitling program, which is the de facto standard for anime subtitling, used by the vast majority of fansubbing groups worldwide. I intend to write thoughts and tutorials on game design, programming, and my recent musings with the development of games on functional languages (e.g. Haskell).